Mrs. Alexander regards French cuisine as perhaps the biggest influence on her cooking. 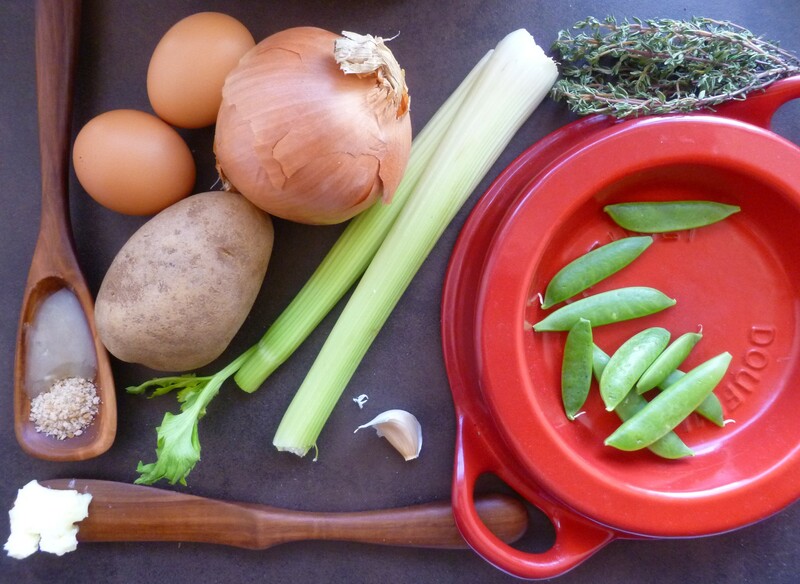 She credits the Gallic style in the way she arranges food, in her preference for “a succession of small courses” and in the way many of her recipes will let “a single ingredient speak for itself”. 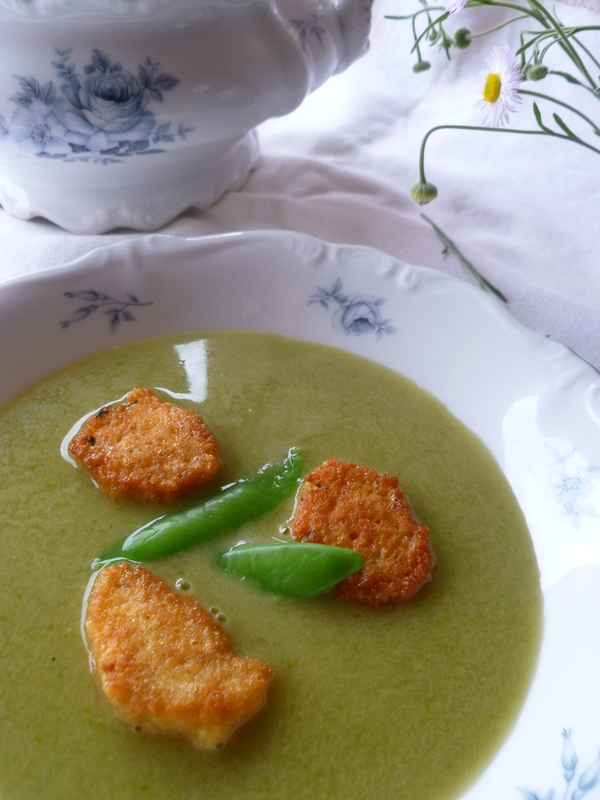 Those cooks who have not had the good fortune to encounter Stephanie Alexander’s recipes, may enjoy an introduction through this recipe for Kitchen Garden Soup with Little Bread Soufflés, adapted from one served in Stephanie’s Restaurant . Timing Note: The soup may be made several hours in advance and reheated. The bread soufflé batter may be made in advance as well and quickly fried just before serving the soup. Ingredients for the Soup: Amounts listed in parentheses will double the recipe to serve 8 people. 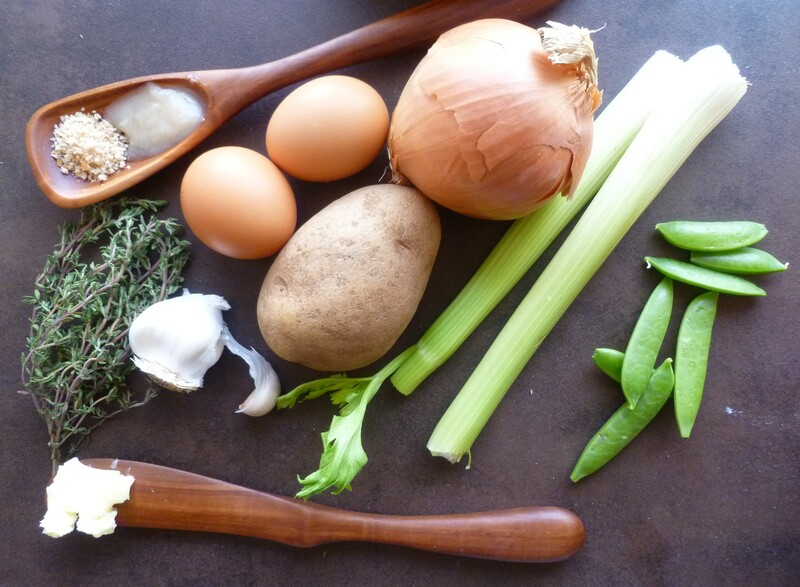 Ingredients for the Little Bread Soufflés: The ingredient amounts will be enough for either 4 or 8 servings. 2 Tablespoons of Goose Fat, Duck Fat, or Vegetable Oil: Goose Fat is used to make the soufflés in the photos. 1. From the total amount of sugar snap peas, remove 8 to garnish 4 servings (or 16 to garnish 8 servings). Place a small bowl of ice water nearby. Fill a small pot with water, add 1/4 teaspoon of baking soda and a little salt and bring the water to a boil. Add the 8 (or 16) peas to be used as a garnish and blanch them for 30 seconds. Drain them and put them in the ice water. As soon as the peas are cool, remove them from the water and set them aside, wrapped up in a dish towel. 3. Melt the butter in the pot over medium heat. Add the onion, celery, chopped potato, bay leaf and thyme. Cover the vegetables with the round of waxed paper, place the lid on the pot and cook the vegetables over medium low heat for about 15 minutes, or until the vegetables have begun to soften and are just beginning to turn golden around the edges. 4. Remove the round of waxed paper. Add the chicken bouillon and bring the mixture to a boil. Reduce the heat and simmer the soup for about 15 minutes more, or until the vegetables are completely tender. 5. 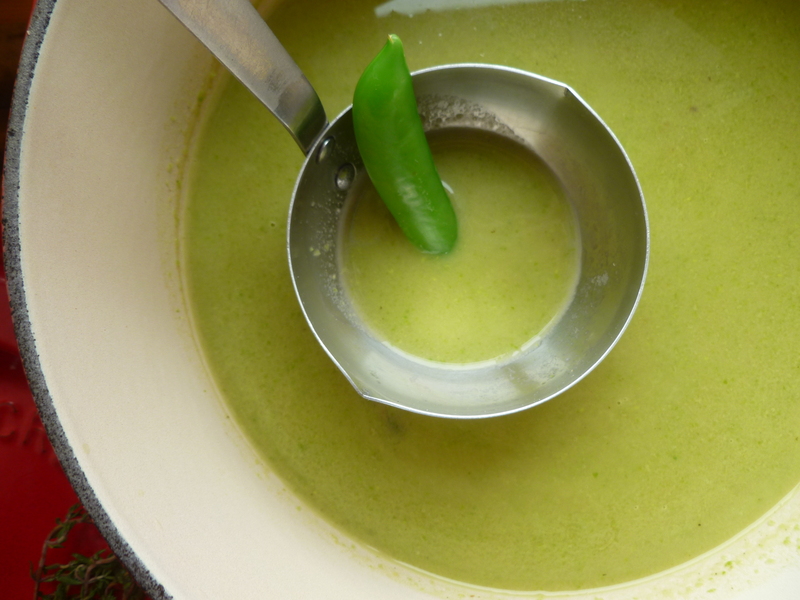 Add the sugar snap peas and simmer for 3 minutes longer. 6. Remove the bay leaf and purée the soup in batches in a food processor or blender, transferring each puréed amount to a bowl. Wash out the pot and strain the soup purée back into it through a sieve or strainer, pressing down hard on the solids as the soup goes through the sieve. 7. Taste and season the soup with salt and pepper. 8. Just before serving, reheat the soup and make the Little Bread Soufflés: Heat the fat or oil in a large pan over moderate heat until it is hot but not smoking. Drop the Bread Soufflé batter by teaspoons into the fat and fry them for about 1 minute, total, turning them when the first side is golden and briefly cooking them on the second side. They will rapidly become puffed and golden. Drain briefly on a paper towel. 9. Divide the soup among bowls. 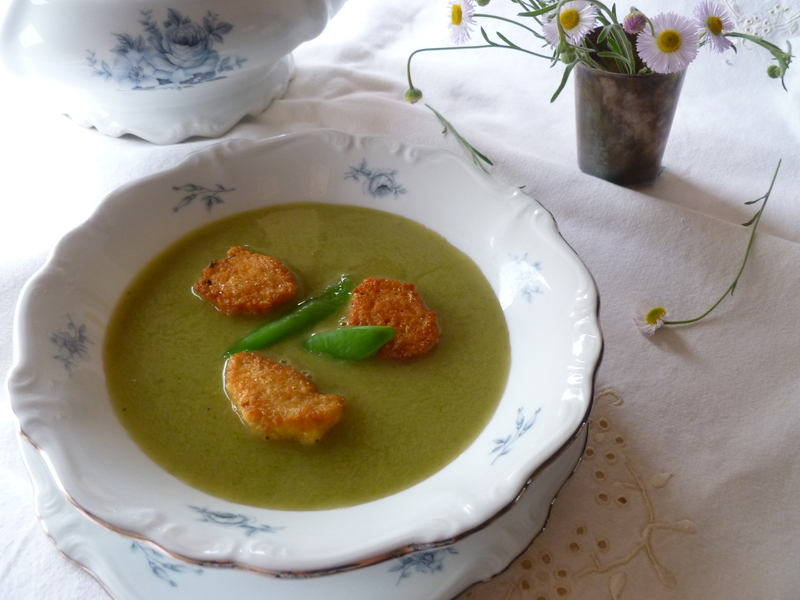 Float a few little soufflés in each bowl of soup and garnish each one with a couple of the reserved, blanched sugar snap peas. 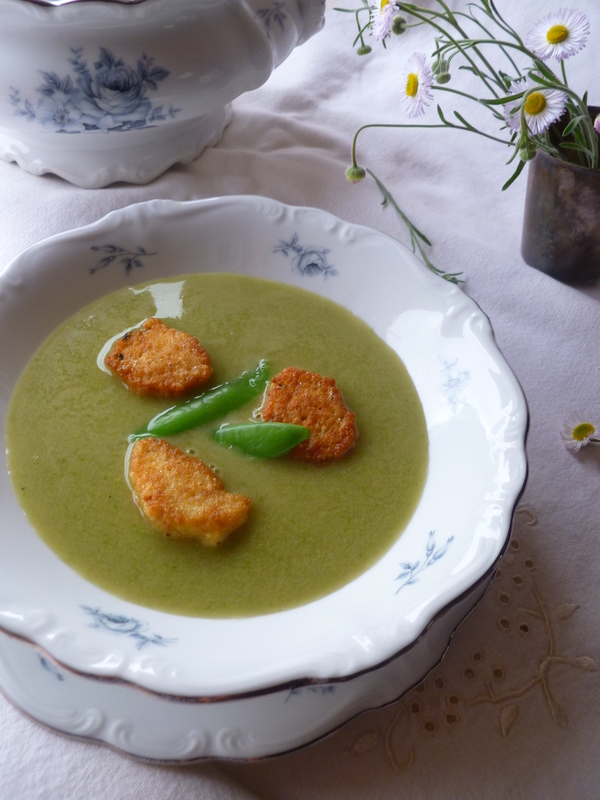 A Note: The First Course of the diplomatickitchen Menu: Easter Lunch is Kitchen Garden Soup with Little Bread Soufflés. The recipe is adapted from one for a soup that was served in Mrs. Alexander’s Melbourne restaurant, Stephanie’s Restaurant.